U.S. Attorney’s Office – District of MA. The owner of this mattress, Cleber Rocha, a Brazilian national, is being detained due to being a flight risk. On February 13, 2013, Paul Burks will be sentenced in United States District Court for the Western District of North Carolina for his role in the ZeekRewards Ponzi and pyramid scheme. The sentencing hearing is open to the public and will be held at the Federal Courthouse at 401 W. Trade Street, Charlotte, NC. Zeek Receiver, Kenneth Bell, has filed a Motion to Enter and Order for determining the amount of Final Judgment against the “Winner Class” members. The Court had entered an Order granting a Summary Judgment and Partial Summary Judgment against the Net Winner Class on November 29, 2016. The Court found that the Net Winner Class received “fraudulent tranfers” that must be repaid to the Receiver. The only issue now remaining before the Court with respect to the Net Winner Class is how to fairly and efficiently determine the amount of the Final Judgment (ZeekRewards net winnings plus pre-judgment interest) to be paid by each of the over 9000 members of the class. that will give each class member individual notice of the amount of his or her “net winnings” according to RVG’s records, an opportunity to respond to that amount with evidence of a different amount and access to a fair and expedient process to resolve any cases in which the Receiver and Net Winner cannot agree on the amount of the Final Judgment. Counsel for the Receiver has conferred with Counsel for the Net Winner Class, and Counsel for the Net Winner Class has stated that the Net Winner Class has no objection to the Receiver’s proposed process. Part of the proposal is notification “on or before January 31, 2017” of the amount of “Net Winnings” as indicated in RVG’s records and the records of the Receivership. The amount of net winnings shall be calculated by the Receiver (through his expert witness) in the same manner as the Final Judgments entered against the named Net Winners in this action. The process proposed is rather lengthy, so here is a link to it on the ASDUpdates Files website. Also listed is the Proposed Order. THIS MATTER is before the court on the parties’ Joint Motion to Continue Sentencing (#119). Having considered the motion and reviewed the pleadings, the court enters the following Order. The court notes that the parties have requested that the court continue the sentencing hearing to or after January 30, 2017 and have reported that February 9th, 2017 is a known conflict for the counsels’ schedules. IT IS, THEREFORE, ORDERED that the parties’ Joint Motion to Continue Sentencing (#119) is GRANTED, and the Clerk of Court is instructed to place this matter on the next appropriate sentencing calendar. Sentencing set for 2/13/2017 09:30 AM in Courtroom, 401 W Trade St, Charlotte, NC 28202 before District Judge Max O. Cogburn Jr. The funds used to make the third partial interim distribution will be taken from the reserves that I previously held for those Affiliates whose claims were disallowed and forfeited pursuant to the Court’s November 16, 2017 Order that required these claimants to provide their Release and OFAC certification by December 31, 2016. Their failure to do so has permitted me to release these reserves and to pay the third partial interim distribution to Affiliates that hold Allowed Claims. You can find the entire document here 194.
orders the Entity Defendants to pay disgorgement in the amount of $135,598,118.47, plus prejudgment interest thereon in the amount of $9,811,646.50, the payments of which will be deemed satisfied by the amounts recovered and distributed by the court-appointed receiver as set to be set forth in the receiver’s final report and accounting to the Court. 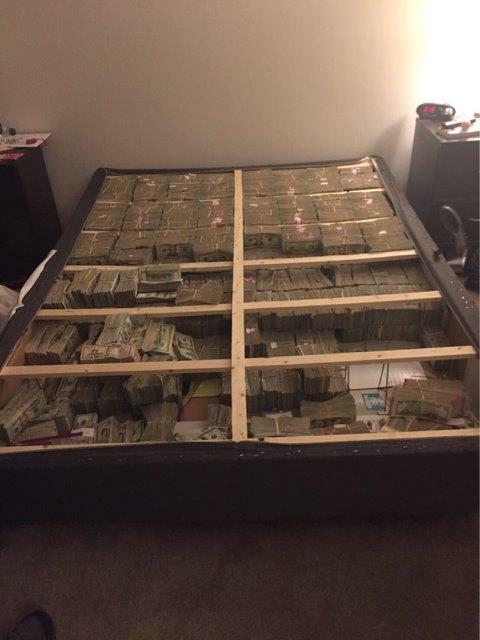 BOSTON –Approximately $20 million in cash hidden inside a box spring in a Westborough, Mass. apartment, was seized late yesterday, and a Brazilian man was arrested in connection with conspiring to launder proceeds of the massive TelexFree pyramid scheme. Cleber Rene Rizerio Rocha, 28, was charged in a criminal complaint with one count of conspiring to commit money laundering. Rocha was detained following an appearance today before U.S. District Court Magistrate Judge Judith G. Dein. According to the complaint, in April 2014, federal agents searched the headquarters of TelexFree, Inc., in Marlborough, Mass. Later that day, Carlos Wanzeler, one of the founders of the company, allegedly fled to Brazil, his native country, where he has remained. Wanzeler and TelexFree co-founder James Merrill were indicted in July 2014 on charges that they operated TelexFree as a massive pyramid scheme. Merrill pleaded guilty to those charges in October 2016 and is awaiting sentencing. The complaint alleges that an intermediary working on Wanzeler’s behalf contacted an associate for help transferring millions of dollars of TelexFree money – still hidden in the greater Boston area – from the United States to Brazil. The associate, who subsequently became a cooperating witness for the government, allegedly arranged with Wanzeler’s nephew in Brazil to launder the cash through Hong Kong, convert it to Brazilian reals, and transfer it to Brazilian accounts. According to court documents, Rocha, acting as a courier for Wanzeler’s nephew, flew from Brazil to JFK Airport in New York City a few days ago. Yesterday, Rocha met the cooperating witness at a restaurant in Hudson, Mass., and allegedly gave him $2.2 million in a suitcase. After the meeting, agents followed Rocha to an apartment complex in Westborough, Mass., and later arrested him. That night, federal agents searched an apartment at the Westborough complex and seized a massive stockpile of cash hidden in a box spring. The cash appears to total approximately $20 million. The charging statute provides for a sentence of no greater than 20 years in prison, three years of supervised release and a fine of $250,000 or twice the gross gain or loss, whichever is greater. Actual sentences for federal crimes are typically less than the maximum penalties. Sentences are imposed by a federal district court judge based on the U.S. Sentencing Guidelines and other statutory factors. United States Attorney Carmen M. Ortiz and Matthew Etre, Special Agent in Charge of Homeland Security Investigations in Boston, made the announcement today. Assistant U.S. Attorneys Andrew E. Lelling and Neil J. Gallagher, Jr., of Ortiz’s Economic Crimes Unit are prosecuting the case. The details in the complaint are allegations. The defendant is presumed to be innocent unless and until proven guilty beyond a reasonable doubt in a court of law.